Our company helps clients to utilize the possibilities mobile platforms provide with applications and content marketing specifically designed for these devices. E-detailing is the best way to engage and envolve your physician target groups in receiving product information. 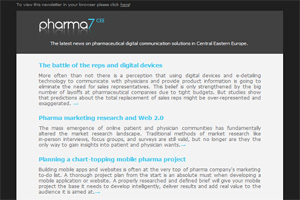 To get the latest news on digital communication in the pharmaceutical industry subscribe to our weekly newsletter. Our company delivers complex online communication solutions for clients to build an innovative and one of a kind digital communication strategy. E-detailing is the first solution to create marketing and information programs with a network-like structure. Our company finds it crucial to provide consultancy and help with building online communication strategies and helping clients to use online channels, digital marketing solutions effectively. Our goal is to develop user-friendly, popular, but reliable and accurate healthcare-related applications. Are you interested in online communication and digital marketing? Would you like to join the young and dynamic team of Pharmapromo? You can view our current job openings here. We are looking for creative and reliable applicants.